Gregory served with St. Vincent’s in Nairobi, Kenya in Fall 2016. From August to October 2016, I served as a communications fellow for the St Vincent de Paul Community Development Organization which serves children born in the Kibera slums in Nairobi, Kenya. 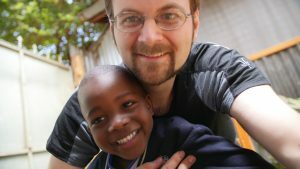 St. Vincent’s runs a nursery school as well as a rescue center that houses 20 orphaned children from the slum and additionally provides school fees, scholarships and food assistance to children and their families. During my time with St. Vincent’s, I produced four short films highlighting their various programs and also created an archive of photographs and interview transcripts of its staff members and beneficiaries. For me, the most striking thing about my experience with St. Vincent’s was that every single one of its beneficiaries I spoke to – from the children who grew up in the rescue center, to former attendees of the nursery school, to scholarship recipients – declared, unprompted, their intention to pay forward the support they had received and use the education, resources, and experience they had gained with the help of St. Vincent’s to assist others in need. Looking at the young men and women supported by St. Vincent’s, born into an environment where most people subsist on less than $3.00 per day and have no prospects for education or social advancement, all of whom are now on their way to fulfilling their dreams of becoming teachers, lawyers, doctors, and nurses, one can glimpse the exponentially positive impact they will have on their community and society going forward for generations to come.